Since the beginning of the year, investors have seen a different kind of comeback in the way of frequent market volatility. The noisy highs and lows of the stock market have become a familiar sound bite. While it won’t win any popularity contests, volatility is often cast as the villain. This assessment leaves out an extremely important detail, namely that volatility is a normal and necessary part of investing, even if the events that stir the markets are far from the definition of heartwarming. Tariffs and Trade Wars – Ongoing issues with tariffs continued to rile global markets with trade war tensions between the United States and its major trading partners intensifying since the spring. The tariffs being imposed are not confined to steel and aluminum. Companies across industries from automakers to the New England lobster industry could be affected by tariffs and retaliatory tariffs. Historians and economists have offered perspective by citing the Smoot-Hawley Tariff Act of 1930, the tariffs imposed on imported steel in 2002 and the consequences that resulted from the trade wars that followed. However, the full effects of a trade war in the current global economy are still to be seen, and we cannot predict how these tariffs will positively or negatively affect the market or the U.S. economy. Fixed Income and Rising Interest Rates – In June, the Federal Reserve raised the federal funds rate by 0.25% for the second time since January. This interest rate increase coupled with expectations of another rate hike later this year resulted in a decline in the value of long-term bonds. Some investors saw this as cause for concern, but it is normal for bonds to lose a few percentage points in the short term when interest rates rise, and those same higher rates denote the expected return on those bonds will be correspondingly higher than they were before. For investors with a reasonable time horizon, such losses are only temporary if they stay invested in the bonds (or the mutual fund holding those bonds). Then, they would receive the same interest payments they would have otherwise and recover the full par value over the remaining life of the bond. Furthermore, as bonds mature and are reinvested, the fund will buy higher-yielding bonds, earning more in the long run. When small cap and value are included in a portfolio, exposure to large-cap stocks is reduced. 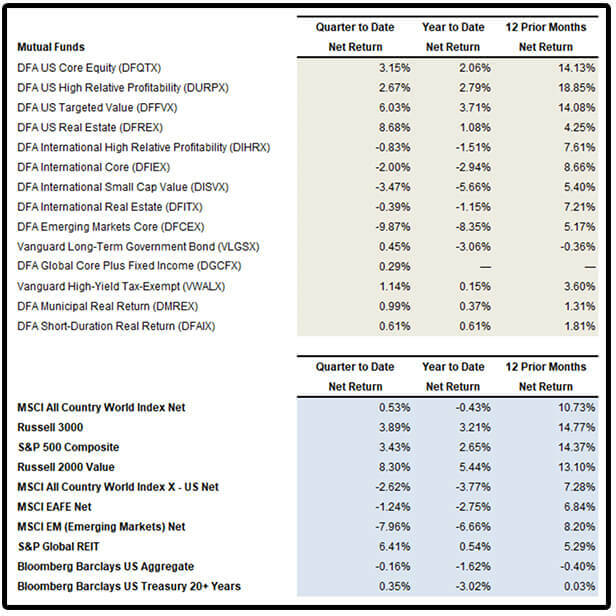 Thus, one of the benefits of a globally diversified portfolio that includes equities and fixed income is the rise or fall of one asset class does not determine that portfolio’s value. Please call our office if you would like to have a conversation about the market or your portfolio. 1 Jon Sindreu and Mike Bird, “Italy Sparks Global Fear of Fresh Euro Crisis.” The Wall Street Journal, May 29, 2018. 2 Dave Shellock, “The Day in the Markets: What You Need to Know.” Financial Times, June 13, 2018. 3 Anora M. Gaudiano, “Why Bulls Are Betting on Small-Cap Stocks to Continue Their Winning Ways.” MarketWatch, May 30, 2018. 4 Small-cap value as proxied by the DFA U.S. Targeted Value Portfolio (DFFVX). Fund return data was obtained from Dimensional Fund Advisors, Envestnet | Tamarac and Morningstar. Total returns include reinvestment of dividends and capital gains and are net of fund fees and expenses. Custodial and advisory fees are not included. PR Wealth Management Group does not reinvest dividends and capital gains. Those amounts are used to rebalance a portfolio. In all the charts above, custodial fees and advisory fees are not included, and the analysis above does not account for advisory fees, custody fees, or tax consequences.